"The drummer" was identified as 24-year-old Jihad al-Natur, and I wrote about him a little in my previous post. But most of the other people behind the code names were not identified. The article did give some clues about the circumstances of each of their deaths, and by comparing that information with the listing compiled by the Israeli civil rights group, B'Tselem, of Palestinians killed by the IDF, I think I have identified the real people killed by R's unit during its service in Nablus, and hidden behind the code names. This one is easy, because the drummer is identified in the Yediot Ahronot report. 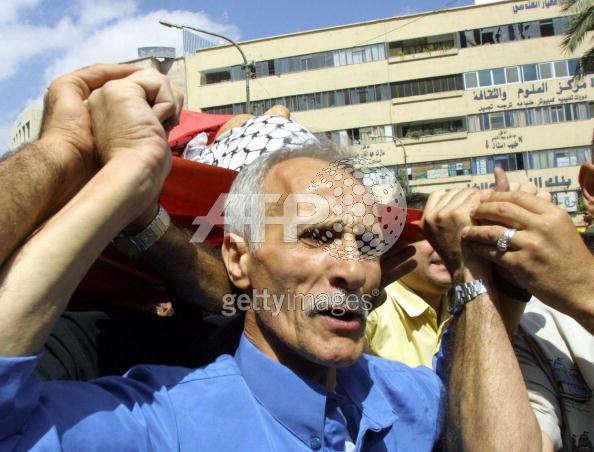 He was Jihad al-Natur, shot by an IDF patrol on the streets of Nablus at about 2:50 on the morning of 27 November 2002, as he was drumming and singing Ramadan verses to awaken the faithful before sunrise and the beginning of the fast. Soldier R, the commander of the paratroopers who killed him, testified that when he served in Nablus: There were many nights on which we received orders that whoever we see on the street between two and four in the morning is sentenced to death [“dino mavet”]. Those were the exact words. 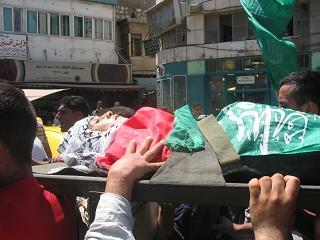 13 year-old resident of Nablus, killed on 10.06.2004 in Nablus by gunfire. Did not participate in hostilities when killed. It happened when the Brigade Commander in Nablus was replaced, and “there was an operation that we jokingly called ‘the Brigade Commander’s horror show.’ At the last stage there were roadblock operations with plastic [barriers] that we called ‘New Jerseys.’ All the time the children, the ones who throw stones, would come and move them. It was a total mess. Then the battalion commander gave everyone an order on the radio: whoever touches a ‘New Jersey,’ shoot him in the legs. Live fire. At 9 pm we heard the soldiers coming in the Old City. A group of us went to check if they are coming or not really and to see if they will occupy any houses. I’m going in the Old City and found twenty jeeps around the Old City. The first coming four jeeps inside the Al-Qaryon district and after that more soldiers. There are twenty of us guys trying to check where the soldiers are. We heard live bullets. We founded a boy shouting. We founded the live bullet in his face and a gaping wound from the back of his head. We take him up near the Zafer al-Masri school to check his condition. The heart for him was not working. We take him in a civilian car to the Tahasuseh Hospital near An-Najah University and the doctor told us he’s died. "The Woman" and "The Old Man"
“The Woman” and “The Old Man” are not named in the paratrooper’s testimony, and their nicknames are not very specific. But we can ascertain from the testimony how they were killed, and this helps in identifying who they were. Several soldiers quoted in the Yediot Ahronot article report that when they were shot at from an unknown source (and sometimes even when they weren't shot at), they would simply unleash undirected "general" fire in the direction of Palestinian houses. Soldier R testifies that in Nablus too his unit would "return fire" to targets it could not locate by shooting indiscriminately on residential areas, describing how everybody shoots freely in 360 degrees at [rooftop] water reservoirs and at everybody whom maybe they identify in the windows. R talks about one occasion when he and his friends fired indiscriminately at houses in Nablus, and shot a 24-year-old woman in the neck. He says that he himself shot an elderly man in similar circumstances. These two people are presumably “The Woman” and “The Old Man” that the unit joked about. NABLUS, West Bank, Sept 13 (AFP) - An elderly Palestinian was killed Saturday morning as Israeli soldiers and Palestinian militants exchanged fire [sic] in the northern West Bank city of Nablus, Palestinian hospital sources said. Fathi Bulbul was shot as he watched Israeli troops raid the Old City from the window of his room, they said. Early in the morning, Israeli occupying forces moved into al-Yassamina neighborhood in Nablus. 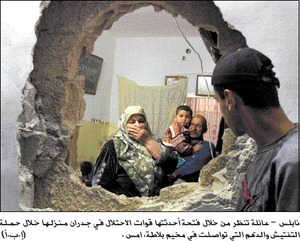 They opened fire at Palestinian houses, killing an elderly Palestinian man. According to PCHR’s investigation, at approximately 02:00, 12 Israeli military vehicles moved into Nablus through its western entrance. They moved forward and surrounded al-Yassamina neighborhood in the old town. They opened fire at Palestinian houses. Israeli soldiers raided a number of houses, including the house of Khaled al-Zhaher, whom they detained together with his family in one room. At approximately 03:15, Fathi Mahmoud Hussein Bulbul, 85, woke up. He tried to get up and leave his bed to find a more secure place in his bedroom that overlooks al-Zhaher’s house. Immediately, Israeli soldiers opened fire at him. He was hit by live bullets and fell on the bed. He cried for help. His son, Bashar hurried to offer him help, but he was not able to enter his father’s bedroom as Israeli soldiers were still shooting. He called for an ambulance, but due to the intense Israeli gunfire in the area, the ambulance crew was not able to attend to the wounded old man until 04:00, when he was dead. According to medical sources, he was hit by two live bullets in the neck and the chest. Seven months before he was killed, Fathi Bulbul's house was badly damaged when Israeli soldiers tunneled through its walls to carry out an operation in Nablus Old City. The woman that Soldier R said his troops killed while shooting indiscriminately at [rooftop] water reservoirs and at everybody whom maybe they identify in the windows is probably Ibriz Durgham Dib al-Minawi who, according to B’Tselem’s casualty listing, was shot dead by the IDF in Nablus on 17 September 2004 while standing on the roof of her home. (Though B'Tselem gives Ibriz's age as 19, not 24, as R believed). At 13:10 on 17 September, the Israeli army raided the city of Nablus and ‘Ein Beit El Ma’ refugee camp, took position in several neighbourhoods, occupied several houses, and converted them into military posts. The Israeli army opened indiscriminate fire, killing Ibriz Dirgham Al Minawi, a female civilian, on the rooftop of her house, and injuring 1 civilian. At 20:00, the Israeli army withdrew from the area. Ibriz’s cousin, Inas, and her mother, Amal, were also out on the roof when Ibriz was shot. They described the shooting to B’Tselem and to Amnesty International. On Friday, 17 September 2004, at around 7 PM, my mother, sister and I were on the roof of our house which is located on al-Arsad St. in Nablus. My 19 year old cousin Ibreez joined us. We often sit on the roof and talk and eat. Ibreez and I are good friends and we would always hang out. We also live in the same building. On the same day, everything was calm except for the media announcements regarding patrols taking place in a couple of areas. We did not hear or see any in my area. We did see two armored military vehicles that turned onto al-Hamra St., which was deserted. I saw one of the soldiers get out of the jeep, look around and after a moment, he looked towards the al-Hamra building. All of the sudden he kneeled down and pointed his weapon in our direction, but we couldn't tell who his target was. Ibreez said he was probably aiming to shoot at somebody and then my mother said we should get out of there. Before my mother finished her sentence I heard a bullet shot. We had been trying to hide under the rail of the roof, and I heard Ibreez yell out "My hand" and then she went silent. I looked over at her and I saw blood streaming down her arm. My mother and I tried to lift her, but we couldn't. Then Ibreez passed out. I tried unsuccessfully to wake her. We then started to yell "Help, Help." Ibreez's brother and the residents of the building rushed up to the roof. We lifted Ibreez and her brother drove her to al-Eitihad hospital. Less then a half an hour later, her brother told us she had died as a result of the bullet that penetrated her chest and became lodged in her heart. We were taken by surprise since we did not think this was going to kill her. There was no reason for the shooting since nothing was going on. I still don't understand what happened. Ibreez was a great person with a strong personality and she enjoyed life. She also loved to laugh. She studied business management at the university. She always said that she wanted to finish school and start a company and create jobs for the unemployed. Ibreez's grandmother, who she is named after, was killed in 1967 when the Israeli forces conquered the city, in the same house where Ibreez was killed. Her grandmother was seven moths pregnant and had fifteen children. She was shot in the stomach and died at age 36. 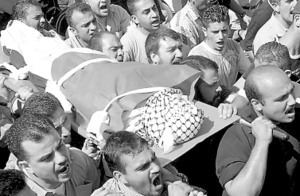 Ibriza Dhargham Dib al-Minawi was on the roof-terrace of her family home in Irsad street, in the Jabal al-Shimali neighbourhood of Nablus when she was shot dead on 17 September 2004. Twenty-year-old Ibriza, a first year student in Business Administration at al-Najah University in Nablus, was one of 10 children. Her mother, Amal, told Amnesty International: "It was early evening, around 7pm, and Ibriza was on the roof-terrace with her aunt, her two nieces and her three-year-old nephew. It was a quiet day, there was no shooting or clashes at all in the area, and we were not worried at all. She had been studying all afternoon and earlier on she had thought of going out to buy a notepad, but in the end she stayed at home". Her aunt Samar, who was on the roof-terrace with Ibriza and the children: "We saw an army patrol of two jeeps on the road down below, by the intersection with Nasirin Street. One jeep had been there a while and then a second came; then a soldier got out of a jeep and shot up. Ibriza was by the edge of the terrace drinking Coca Cola; she was holding her glass in her left hand. She was shot through the left wrist and the bullet went in her heart. She fell to the ground, said ‘my hand’, and died immediately". Of all the codenames, “The Baker” is the easiest to identify, and the circumstances of his death are easiest to reconstruct, largely because the unusual brutality of his death attracted the attention of human rights groups and international journalists. He was killed in an IDF operation called Calm Waters, which ran from 16 December 2003 to 6 January 2004, the purpose of which was ostensibly to capture one wanted man, Naif Sharekh. Nineteen Palestinians were killed in the course of the operation, fifteen of them (including Adawiya) were unarmed civilians, six of them were children. There were indications that two of the dead (again, including Adawiya) had been killed execution style when they were already wounded, and this is what prompted journalists and civil rights groups to investigate the deaths. It is because of their involvement that we know much more about the death of Ala Adawiya than we do about most Palestinians killed by the IDF. In addition to that of the paratrooper R, who was involved with the sniper team that fired the first shot, eyewitness testimony is available from a second IDF soldier who watched the killing from the house opposite the sniper's nest; also from a 50-year-old Palestinian woman, As’ad Hanun, who lived in the house in front of which Ala Adawiya was killed; and from Adnan Soso, the ambulance driver who was summoned after the first shot was fired. These last three witnesses all saw the “confirmation of kill” procedure carried out. 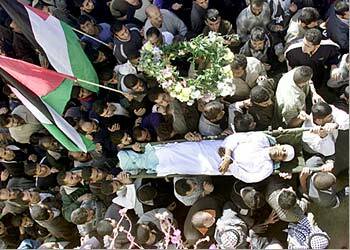 (Photo: al-Ayyam, 18 Dec 2003; via al-jazeerah.net). Having checked the contents of Adawiya's bag, which was found to contain nothing more dangerous than some floured-dusted clothing, the soldiers permitted Adnan Soso to remove the body to Rafidia Hospital. Upon arrival, it was examined by Dr Samir Abu Zarour, who reported that Ala Adawiya had been shot between eight and 10 times, including twice in the face and once in the testicles, and had a series of fragmentation wounds in his legs. If Jihad al-Natur, Hani Qandul, Fathi Bulbul, Ibriz al-Minawi and Ala Adawiya had been Israelis or Americans - i.e. people like "us" - Yediot Ahronot would not have left them hidden behind stupid, demeaning nicknames, but would have taken the trouble to make them real people with real names. But they were only Palestinians, so it's left to some obscure pseudonymous blogger to do it instead.